Back in the day, I took budgeting to the extreme. I recorded every single transaction I made, including one time when I bought nothing more than a single stamp at the post office. I used a complicated spreadsheet to track my spending, note month-to-month changes and trends, and set limits and goals for our family budget. That was then. This is now. And what’s changed? Adding kids to our family. You’ll notice there isn’t a column for investing; other than the money we blindly threw at our employer-sponsored 401k accounts – money which came directly out of our paychecks – we weren’t really investing in anything. Overall, our monthly budget of $2414.58 represented just 56 percent of our post-tax income, giving us a huge amount of discretionary income. We should have been investing; we should have done a lot of things with the nearly $2000 surplus we had every month. Instead, we did what dumb, young people do – we bought new cars (they’d be family friendly! ), we put on an addition to our house (we were going to have kids, we’d need the space! ), we went on pricey vacations (our last without children!). And while we did build up a rather large emergency fund, we spent just about all that remained. 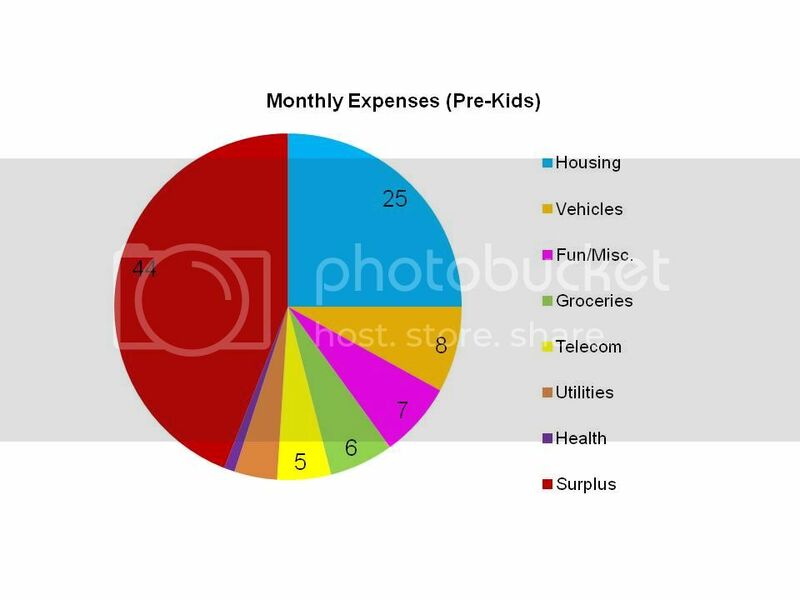 A few notes with this post-kid budget. First of all, we paid off both of our cars – they’re 2008 models – before the end of the loan’s term, so they’re not included on this monthly budget. Also, you’ll note that our investments still look paltry at $150 a month – however, that doesn’t show that we’ve also doubled my husband’s contribution to his company 401k, to give him the maximum matching benefit from his employer. Some bills have gone up – like our cell phone service, utilities, gas and groceries – while others have gone down. Instead of having fun by going out to dinner or taking in a movie, we go to the park or roast marshmellows in the backyard. The YMCA (my gym membership) is a family center, so I can take the kids there while I exercise, or take them to the outdoor pool to play in the summer. It may be the best-spent $83 in the whole budget. Overall, we’re bringing home less money than we were pre-kids, meaning our $2657.48 monthly total represents a bigger chunk of our cash flow. Since I freelance, my earnings aren’t always the same month to month, but on average, my husband and I bring in a combined $3300 – that’s after taxes, after medical insurance (which is now a plan for a family of four, instead of just two adults), and after a roughly $300 monthly contribution to his 401k. 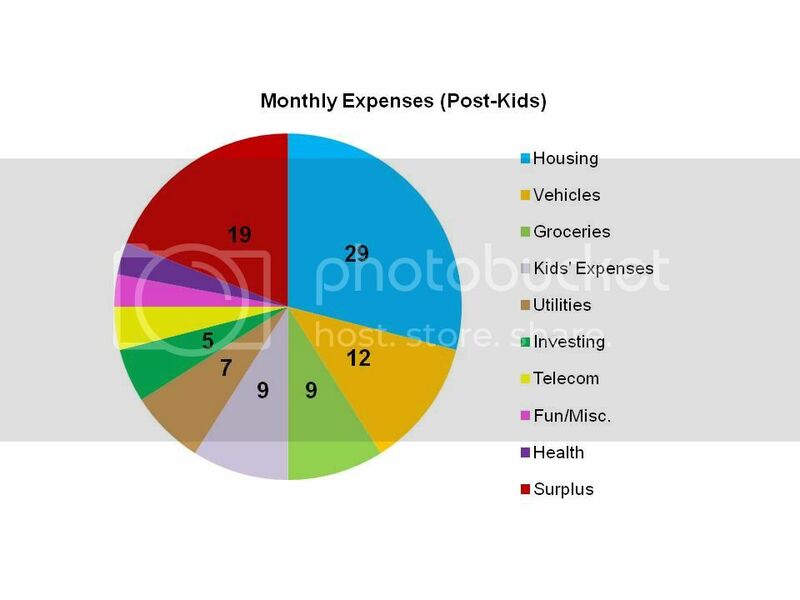 We typically spend about 80 percent of what we bring in on a monthly basis, although that still gives us several hundred dollars of wiggle room every month; most of that goes into savings for our housing fund, although sometimes it does get added to the “Fun” section of the budget. Reader, how has your monthly budget changed as your family has grown? I found this post via Google, so I’m not sure when it was posted. You’re overpaying for your wireless service. I have a smart phone (only $120 total) with unlimited everything (even data) and I’m only paying $45 a month (with a pre-paid plan from StraightTalk, which uses Verizon’s fantastic network in my area). I could conceivably be paying less (with RepublicWireless), but I don’t have Internet at home, so I’m nervous about switching to their system (which relies a lot more on wi-fi for calls and uses Sprint towers, which have bad coverage in my area).